Both the Thais and the Burmese love to smile, but there is one striking difference. 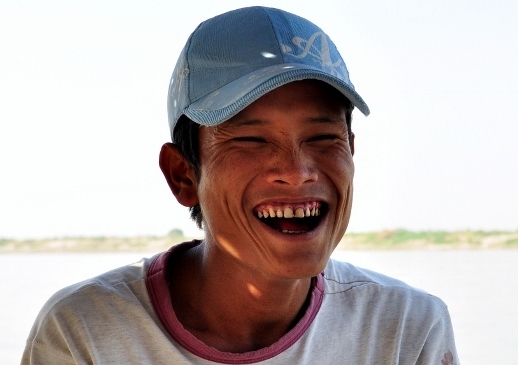 Don’t expect any pearly whites because Burma is a betel-chewing country, and wow does it leave its mark! Described by my boyfriend as “an explosion of spice that gives you a light, airy feeling and makes your mouth go numb,” chewing the betel nut has another side effect: it turns your lips, gums, and teeth red. Luckily for Eugenio, it doesn’t appear to be permanent, at least not for a first-timer. To fuel the Myanmar’s biggest habit, betel stands are on every street corner and in every market. Operated by one person, each stand contains a pile of bright green betel leaves, a bowl of chopped betel nuts, a jar of slaked lime (used as glue), and several containers of spices including: anise, cardamom seeds, cloves, cumin, cinnamon, rose powder, tobacco, etc. The Chewer approaches the stand and selects his choice of spices, and the Betel Man gets to work. He applies the slaked lime paste to the leaf, places the spices in the middle, carefully folds the leaf into a nice package, and places it in a small plastic bag. Each bag contains 4-5 of these betel packets, to be consumed throughout the day. We were told that similar to smoking, betel-chewing helps curb hunger and keeps you awake. But the real fun begins after a few minutes when the chewing has stimulated the excess production of saliva. Loogie hocking is apparently a form of art, and the Burmese are professionals. The sound of snorting & gathering of phlegm is constant and the streets, sidewalks, and buildings are covered with these red, chunky splatterings. So you best watch your step. This entry was posted on February 19, 2013 by Katie. It was filed under Myanmar (Burma) and was tagged with betel chewing, betel nut, betel stands, Burma customs, Myanmar customs, Spitting in Myanmar. Spitting… So, a bad habit of betel chewing results in spitting. No excuse for city folk (only men, really) who are comfortable doing this anywhere. Ugh! Stop it, guys!